Add a stylish and colorful piece to your home with this distressed area rug. 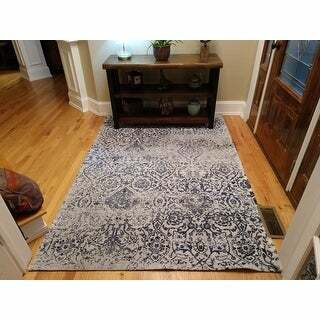 This rug features a damask pattern and provides a fresh and appealing vintage look. The rug is edged with slender ribbon borders for a modern finish. 42.0 In. X 5.0 In. X 5.0 In. Dimensions 42.0 In. X 5.0 In. X 5.0 In. I will just say that I LOVE THIS RUG! I read previous reviews and determined 2 important things to me. It is comfortable on bare feet and it camouflages bits and pieces. With cats, dogs, and kids, these things were mandatory. I read, but did not truly understand the phrase "jacquard-woven rug." Basically, this rug has the texture of a saddle-blanket or woven Native American piece. It is not a carpet with what I think of as a "pile." It also, does NOT have the hard, rough backing that you find on carpet. All of these unique features are huge advantages to this rug. It rolls out almost completely flat immediately. There is absolutely NO harsh chemical smell. The backing is soft, so it will not scratch my wood floors. The weight of my furniture anchors the rug, but a non-skid pad may be necessary for you. 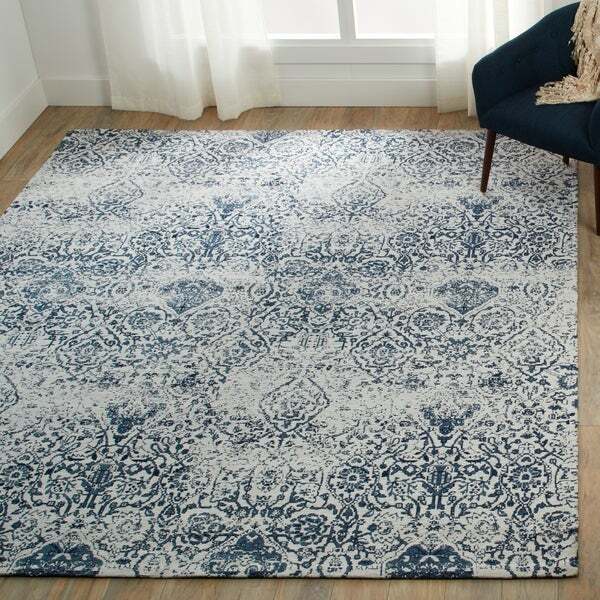 Because it is very thin (.25 to .50") it also lends itself successfully to rug layering, if you have a tendency towards the hippy/boho/moroccan decor. The colors and quality are great. It is a true navy and cream. To be honest, I saw a similar, comparably (full) priced product in a popular high-end home decor store. It was 100% polyester and had that chemical smell that is annoying and gives some people headaches. I decided to purchase this from Overstock because it was on sale and was priced significantly lower than the other store. I am so glad I did. This rug is a much better solution. I am really happy! Love this rug. Beautiful colors. Pattern looks even better in person than I expected. Definitely not thick so I invested in a rug pad which makes it cozier without raising the profile off the floor too high. I've had for a few weeks and overall very happy. The picture was in the evening and my room has limited light so appears dark. Absolutely beautiful! 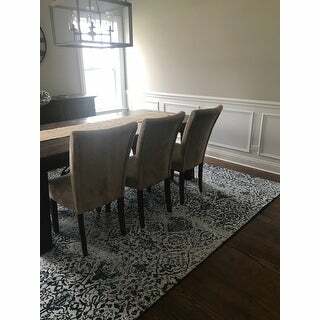 I love the distressed look this area rug has. 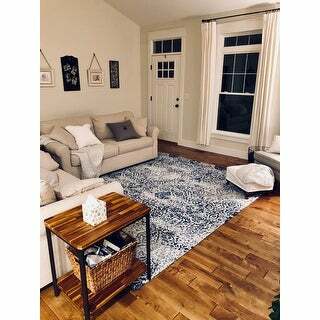 Although my favorite color is navy blue I love hat this area rug is not over powered by the blue that the touch of ivory is just enough to tone it down a little. Love this rug and the color is perfect! Love this rug. I spent hours looking at rugs and finally settled on this one. It's a great neutral rug and looks expensive. The color is a mix between a grey and a beige with an ivory which was exactly what I wanted. No issues with the edges staying down. I would definitely recommend this rug, I absolutely love it! The base color is more white than cream, which I prefer. I love the distressed, vintage look. 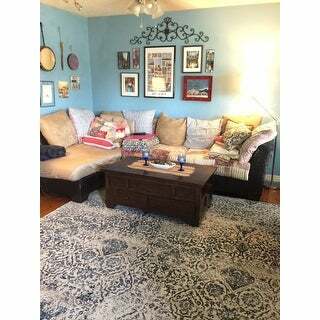 Love all the Nourison rugs. The material is great for any high traffic area. Soft and easy to keep clean. The print is beautiful! Rug was exactly what I wanted! The pictur on the website is true to what it actually looks like. Great price too! I really loved the rug. We plan on painting our wall a dark navy to complete the rug with white waisnscotting. The rug has several shades of blue along with white/gray under tones. I love this rug! exactly as described on the website and looks just like the picture! lays very flat from the moment i opened it! 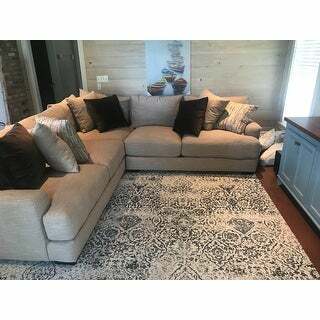 it is thin as described but that's what i wanted...it is under my couch and loveseat and seems to stay put without a rug pad even with two rowdy boys running around. Perfect addition to my space! As pictured...great "griege" neutral color...perfect vintage charm! Very pleased with purchase! Looks pretty until it faces daily use. Then it seems to absorb dirt and will never let it go. Impossible to clean. Would not recommend. Nice, distressed rug. The blue is navy. This is a very nice, stylish rug. I love the way the colors are white washed. I used this rug on the first floor hall in the winter. It helps hide the white residue from the salt and snow, and most of all it keeps my hardwood floor from looking dull as a result. Love this rug! The distressed look to it actually makes the colors pop more. This is a good rug for the price. Im using it under my dining room table. Like other reviews mention there is a chemical smell to the rug that wouldn’t go away so I steam cleaned it and all is well. It is thin as expected for the price range. Overall I’m happy with the purchase and received what I expected and paid for. 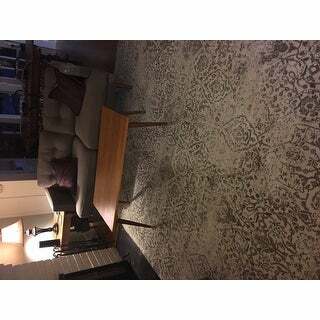 Very pretty rug, bought it for my home office and it looks great. My chair has no problem rolling around on it. It finishes off the room, it's going to make working so much nicer in such a pretty place. 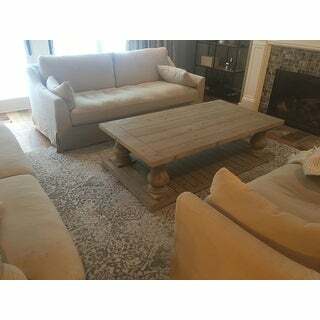 "Is the weight of the rug enough that it doesn’t easily roll up or wrinkle with the movement of furniture on it. For example under a dining table, moving chairs in and out. " Our rugs are sent and delivered rolled-up so it may need to be flattened on the edges when unrolled but will unroll and lay easily. "The picture shows 2 different rugs. One seems to be the Distressed Damask Ivory Rug & the other does not seem to be distressed. How do I make sure when I order this, that I receive the distressed one??" 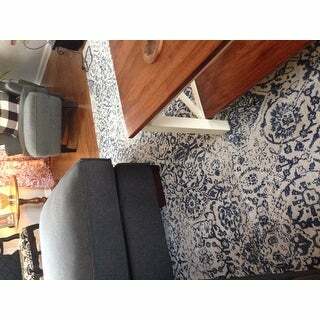 "Can anyone that purchased this rug tell me what color curtains they have with it? I'm really bad with colors! My walls are sea salt if that helps!" "The picture shows two different rugs. If I order this rug which one will be sent? " "Does it come in larger sizes? 9x12 maybe?" "Can this rug be placed over carpet?" Yes. It is thin, so putting it on top of carpet would be fine. "Does this rug have a cut pile, or is it flat / woven?"